LOVE THIS PROJECT! Swirls, checks, dots. All kinds of colors. Wow! 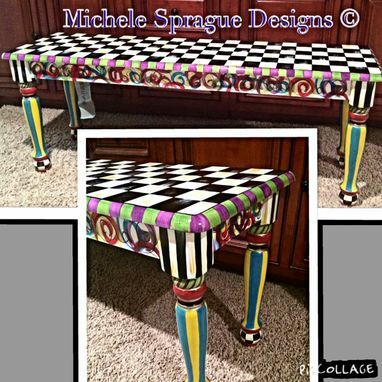 You can either have a bench painted just like This, or you can have a custom design. Your choice. That's the beauty of my "paint per order" system. Imagine this bench with a beach scene on the sides, or mountains and pine trees for an Adirondack feel. Maybe no scene at all. Perhaps colorful polka dots....maybe a "puzzle" motif for a child's room.......I could go on forever! This is a large piece, measuring 47.5L x 14W x 18H inches. It is perfect for any space, but can also be paired up with a Farmhouse Table and a second bench. 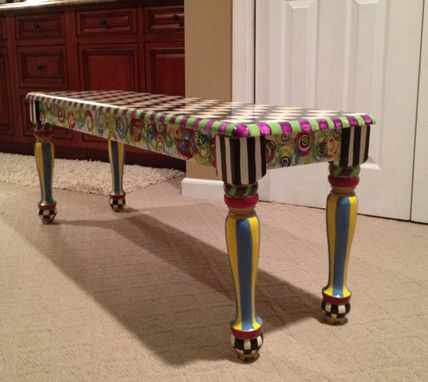 What an amazing focal point THAT would be in your dining area! !